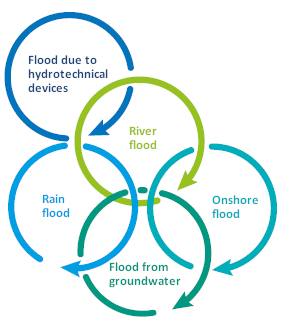 Review and Update to the Preliminary Flood Risk Assessment (PFRA) in the second planning cycle has been carried out within the framework of the project POIS.02.01.00-00-0014/16 funded by the Operational Programme Infrastructure and Environment 2014-2020, II Priority Axis: Environmental protection, including adaptation to climate change, Activity 2.1 Adaptation to climate change along with ensuring safety and increasing resilience to natural disasters, in particular, natural disasters and environmental monitoring. The goal of the project was to review and update the preliminary flood risk assessment by 22 December 2018 r.
The immediate effect of the implementation of the Project, which is the environmental effect, is to develop reports from WORP review and update, cartographic visualisations and spatial databases for at least 5 river basin areas, as well as reports to the EU Commission. the National Geological Institute – National Research Institute developing the preliminary assessment of flood risk (PFRA) in terms of flooding from groundwater (undercuts). Using new EU Commission report schemes (Floods Directive Reporting Guidance 2017). In 2016, the President of the National Water Management Board proceeded to draw up the review and update of the preliminary flood risk assessment (PFRA). The preliminary contract was signed on May 11, 2016. Contracts with contractors were signed in 2017 (Task 1) and 2018 (Task 3), and PFRA will be prepared and published by December 22, 2018. Reports from the implementation of the review and update of the preliminary flood risk assessment will be delivered of the EU Commission by December 22, 2019. March 22, 2019 - submission of the report from the implementation of PFRA to the European Commission.